Numerical attributes (like scale_factor and add_offset) were not read correctly with 2.2.0. Source and binary packages will follow soon. 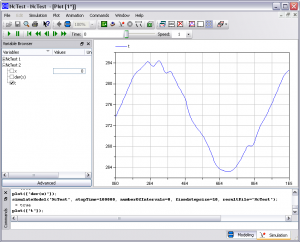 This example demonstrates the use of the library ncDataReader2 to access data sets from Modelica in a way suitable for the simulation system. The access is handled via external functions from Modelica which read and interpolate the data stored in netCDF files. Dymola is used as the simulation system here. As ncDataReader2 is a simple, platform-independant library implemented in ANSI-C this approach should work (in theory) with other Modelica implementations too. As soon as I have tested other simulation systems the results will be documented here. A typical use is reading weather files into a thermal building simulation. The weather files contain different climate parameters like air temperature and humidity, radiation, wind speed as time rows for one year as well as latitude, longitude and the timezone for one location. You can easily exchange the data file and simulate the building in a totally different location without touching the model. 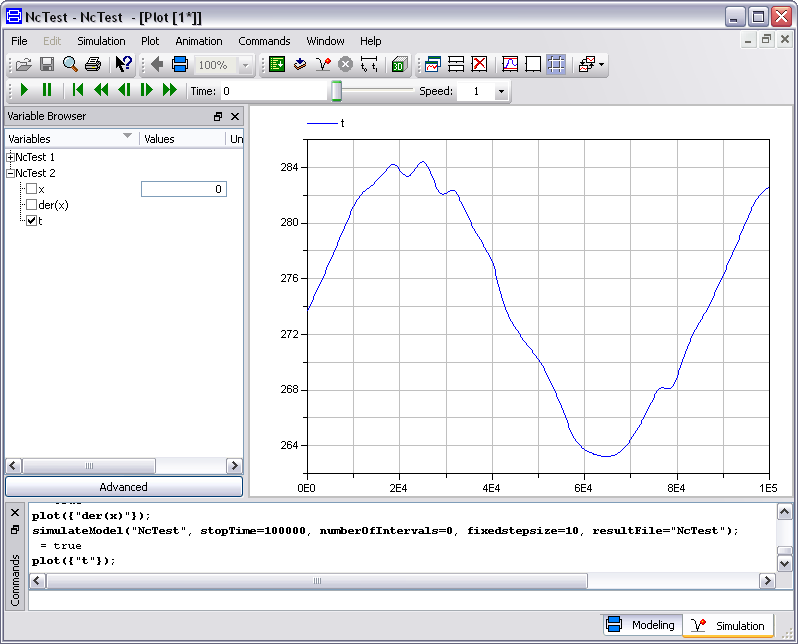 ncDataReader2 is used in the Modelica library FluidFlow. If you don’t already have Dymola installed, you can download a demo version here. It has some restrictions but will work with the simple model used in this example. The following model is used as a starting point for our example. The equation for t will be exchanged with a function call in the next steps. x is just a dummy to have something to integrate. There is no special installation procedure. Just put the necessary header and library files into the working directory (usually where you saved the model file). Which files are actually needed depends on the Dymola version and the compiler (gcc, msvc). The easiest way is to extract the whole contents of precompiled binary package (Win32 zip) into the working directory. It includes everything needed by Dymola and the executables ncgen and ncdump which are used in the next step. If you compile ncDataReader by yourself, you should at least copy ncDataReaderEA.h and the netCDF and ncDataReader2 library files (dll and/or lib). The next file makes the C functions of the library ncDataReader2 available in Modelica. It contains descriptions of the most important functions of the library (actually of the easy api / EA) that can be read by Modelica. Just put it in the working directory. The data must be stored in file in netCDF format. There are many different ways to convert data to this format. My favourite way is a python script that uses one of the netCDF-modules. to convert the following file or download the example file here. ncgen is usually shipped with netCDF. This file contains the two variables time and temperature . The temperature will be interpolated with cubic Akima splines and time will be handled periodically. A netCDF file can be converted back to a CDL file with ncdump. The variable t as a function of time will now contain values from the file instead of the functions used above. An import statement is necessary to use the functions from the library. The call to NcEasyGet1D will return a value of the variable temperature in the file datafile.nc for the current value of the variable time. That’s it! Just run the simulation and look at the results. The temperature is read and interpolated from the file. It can be used as a normal variable in models. This was only a very basic example. Of course you can read and interpolate a large number of variables using different methods of interpolation and extrapolation. Scalar parameters can be read as well. Please have a look at the documentation of ncDataReader2 for more information on the naming conventions, attributes and more. The conversion of data to the netCDF formats looks confusing to the beginner but is not hard to understand. A typical CSV file can usually be converted with a couple of lines of Python code which is my favourite method. ncDataReader2 works both with netCDF-3 and netCDF-4, but you should not mix the tools and libraries between both versions. As a python fan I couldn’t resist porting this to python to get a small and flexible script. It can be easily extended to save the data, create charts (maybe using matplotlib) or present a web interface. By looking at the raw data I noticed that bytes 6 and 7 (maybe more?) contain a time value. Maybe it counts the seconds since the initialization of the device? The first version of my script is mainly a port of the C program. The script uses pyusb 1.0, a python wrapper for libusb 1.0. You may have to install it manually, most linux distributions come with older versions. I plan to extend this to a python package using OO, cleaner interfaces, better error handling and more.